Hunty! Are you ready for the Hamilton Pride Week opening party? Yassss! Come Through!! Sickening!!! Hamilton Pride is celebrating it’s 10th anniversary, and we think that is something pretty epic to celebrate! We are so proud to announce that Ending HIV is our official Pride Week Opening Party Sponsor! So join us at the Meteor Theatre for an evening of fabulous live entertainment including singers, dancers, musicians, comedians and of course local Drag Talent! Still keen to party at Midnight? No worries – Hamilton Pride & Biddy Mulligans On Hood Street have you covered with an exclusive after party for Pride Week guests only! Ending HIV Presents 10’s 10’s 10’s Across The Board will be hosted by Hamilton’s Double D’s – Dangerous? Dirty? Dashing? Drama? Or all of the above…. No no, it’s none other than Previous Miss Drag Waikato, The 1st lady of Fierce, DIVA and the fishy, feisty and fabulous, Miss Auckland Pride 2015, DAKOTA! So make sure you book it in your calendar now, it’s going to be a sell out event and we can’t wait to celebrate 10 years of Hamilton Pride with you all! 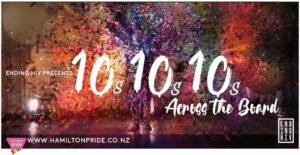 Ending HIV Presents 10s 10s 10s Across The Board | Hamilton Pride Week | 10 Years on | Finding our History | Opening Party | The Meteor Theatre | Saturday 1st September | 7:00pm – 12:00am | All ages Inclusive | Koha for Entry | See you there!! !